Executed in 1983 at the pinnacle of the artist’s career, the present lot combines many of Jean-Michel Basquiat’s most noteworthy techniques and imagery. Xeroxed collages of skulls, repetitive text, and vibrant blocks of blue paint cover the canvas in a chaotic symmetry, quickly drawing the viewer’s eye from one place in the composition to the next. 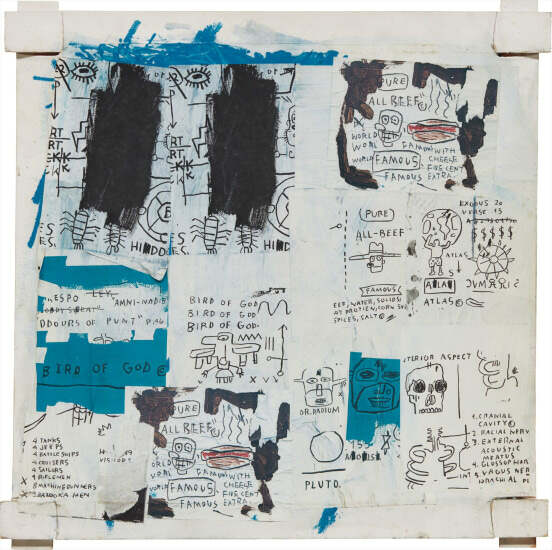 These elements cover a canvas stretched atop a wooden support, exposed at the corners, a technique that Basquiat frequently utilized at this time to stress the rawness of the medium, uniquely making the work both object and painting. The use of childlike, handwritten text is perhaps the most distinctive aesthetic convention present, even more densely applied than in other works by the artist from this year. Phrases like “Bird of God” and “Pure All Beef” read as a stream of consciousness, revealing Basquiat’s inner demons and imagination. As Tony Shafrazi described, "Basquiat's use of text is too deeply hermetic and coded to be directed to a particular class in a glib or knowing fashion. Since his scrawls are often autobiographical in nature, and chronicle a tumultuous personal life and journey, they are possessed of a more unconscious desire to confess or report... Basquiat's early graffiti grew out of an instinct of primal expression that was more in line with the historical origins of the art" (Tony Shafrazi, Jean Michel-Basquiat, New York, 1999, p. 13). The graffiti-like imagery present in Untitled not only pulls from Basquiat’s own humble beginnings as a street artist, but also from the influences of some of his most well-known contemporaries. The rows of Xeroxed paper recall the same repetition present in Andy Warhol’s silkscreen canvases, an artist with whom Basquiat began collaborating at this time. Unlike Warhol, however, Basquiat is not appropriating and repeating anything derived from mass media imagery, but rather his own personal motifs and symbols. The imperfection of the Xeroxed paper rows, combined with the artist’s Cerulean blue brushstrokes, which disrupt the linear borders of the collage, exemplify Basquiat’s inimitable contribution to the history of painting, distinct from those of his contemporaries. His distinctive style even further bridges the visceral energy of New York’s 1980s art scene with the personal, expressionistic tendencies of his abstract predecessors, such as Cy Twombly and Jackson Pollock, and yet Basquiat is entirely distinct from them too. As Klaus Kertess explains, “words play a more obsessive and prominent role in his art than in Twombly’s; and his chanting rhythmic repetitiveness for the first time mixed sound into this brew of sense and senses. Basquiat’s visceral receptivity also brought some of Pollock’s lyric passion back into painting”(Klaus Kertess, “Brushes with Beatitude” in Jean-Michel Basquiat, exh. cat., Whitney Museum of American Art, New York, 1993, p. 54). Indeed, the present lot simultaneously demonstrates some of the 20th Century’s key players’ influences on the artist and further Basquiat’s unique personal style, making it a stellar example of his wholly distinct place in the trajectory of art history. One of the most famous American artists of all time, Jean-Michel Basquiat first gained notoriety as a subversive graffiti-artist and street poet in the late 1970s. Operating under the pseudonym SAMO, he emblazoned the abandoned walls of the city with his unique blend of enigmatic symbols, icons and aphorisms. A voracious autodidact, by 1980, at 22-years of age, Basquiat began to direct his extraordinary talent towards painting and drawing. His powerful works brilliantly captured the zeitgeist of the 1980s New York underground scene and catapulted Basquiat on a dizzying meteoric ascent to international stardom that would only be put to a halt by his untimely death in 1988. Basquiat's iconoclastic oeuvre revolves around the human figure. Exploiting the creative potential of free association and past experience, he created deeply personal, often autobiographical, images by drawing liberally from such disparate fields as urban street culture, music, poetry, Christian iconography, African-American and Aztec cultural histories and a broad range of art historical sources.